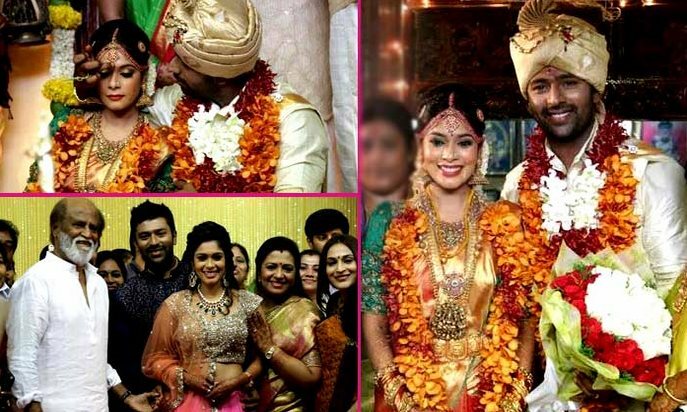 Shanthnu Bhagyaraj married VJ Keerthi on Friday, 21 August. The marriage was attended by the some of the big names of the film industry. Ilayathalapathy Vijay, Prabhu Ganesan, Venkatesh, Parthiban, Khushboo, Mani Ratnam with his wife Suhasini, Vishal, Karthi, Jyothika, Soori, Vijaykumar, Sarath Kumar with his wife Radhika, and many other notable personalities graced the wedding to bless the newly married couple. The whole wedding affair is now trending of social media platform Facebook with the wedding pictures of Shanthanu and Keerthi being shared online. Both Shanthanu and Keerthi were seen wearing traditional Indian attire for the wedding. Shanthanu wore a white silk shirt and dhoti while Keerthi adorned a beautiful orange and green saree. She wore intricately designed heavy jewelry that went along with her traditional look. Later she was seen a peach and pink Lehenga and Shanthanu wore a purple Sherwani. Shanthanu Bhagyaraj who debuted with Sakkarakatti in 2008, is the son of popular actor and director K Bhagyaraj. Keerthi is the daughter of the popular choreographer Jayanthi and Vijayakumar. She has a huge presence as popular anchor on a television channel.